All this week, The Takeout’s Kevin Pang will be cooking from Anthony Bourdain’s Les Halles Cookbook and writing about his experience. Read previous posts about French onion soup, boeuf Bourguignon, and pork rillettes. John, Paul, George, and Ringo by themselves would likely just have been four dudes named John, Paul, George, and Ringo. It’s when they got together that alchemy happened. In food, there are likewise wholes greater than the sum of their parts: Bacon + cheese + onions on a burger, for one. Sausage + gravy + biscuits. Tomatoes + mozzarella + olive oil. Without a doubt, though, my favorite is lemon + butter + capers. 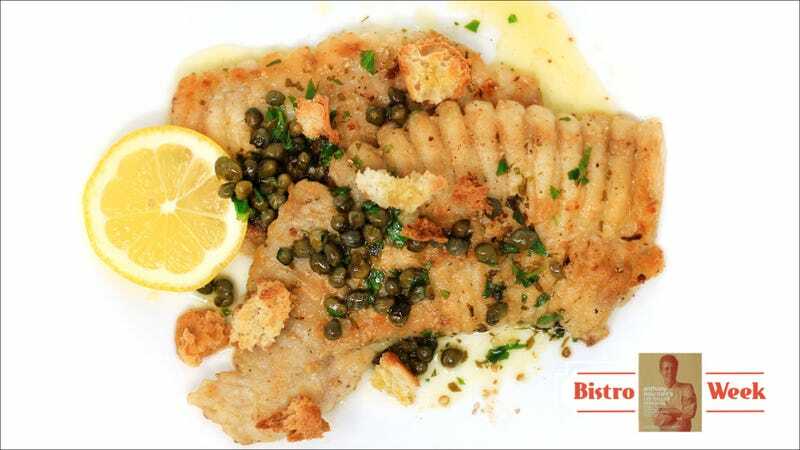 I could recall my first bite of veal piccata as a child, moments later spattering brain matter all over the restaurant. It was a further revelation when I realized the same combination could be applied to roast chicken (roast it crispy, hack it up, drench it with lemon-caper butter and sop up sauce with crusty bread). For me, the pinnacle of this ingredients trio is the French method of cooking fish Grenobloise-style (Try pronouncing it—it’s fun!—Grrrruh-nah-blu-wahs). I remember the month and year the first time I tried it: July 2012, at a well-regarded French bistro in my hometown Chicago called Bistro Campagne. Even better than veal or chicken was serving lemon-caper browned butter with pan-seared trout, topped with grapefruit and orange supremes, green beans, and crunchy croutons that soaked up the butter sauce. The thought of making the dish was a different matter. When I wrote yesterday about making pork rillettes, I mentioned that seemed like a dish better left to chefs. It never felt like a dish suitable for home cooking. Let’s talk about the fish. Skate wing is one the more undiscovered, cheaper cuts of fish; the generous serving-for-one above cost me $8 in metro Chicago. Skate comes from the ray family, a hideous-looking creature, but as Bourdain called it, “one of the truly great seafood items: tender, sweet, well-textured.” More luscious than firm, appealingly flaky, and Bourdain’s description of “sweet” is apropos. What lessons did I glean from cooking skate wing Grenobloise? It’s in understanding the construction of a dish and the importance of editing. In the Les Halles Cookbook recipe, every component plays a role; there is no extraneous element. The flour dredge fries the fish crisp, which helps soak up the butter sauce. The acidity of lemon juice and capers cuts through the richness of butter. Chopped parsley adds a herbaceous undertone. The croutons provide texture. This was, in my view, a masterfully engineered recipe. There are, of course, ways to improve the dish. Allow me to offer two tweaks relating to the finishing sauce: Juice from a whole lemon seems too much when added to only two tablespoons of butter. I’d suggest starting with juice from half a lemon, then adding more to taste. This isn’t just about the flavor, but retaining the creaminess of the butter sauce by not thinning it out. With every dish I’ve cooked from the Les Halles Cookbook this week, each was increasingly more impressive and easier than the one previous. That this effortless entree—so far the best thing I cooked all week—involved butter, lemon, and capers is a bonus. If I were a cooking neophyte but wanted to seriously impress someone, I’m convinced fish Grenobloise-style is the dish to pull out of your bag of tricks. Add it to the growing list of reasons to fall head over heels for this cookbook. Tomorrow: Closing out the week with chocolate mousse.